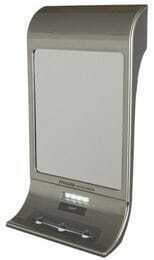 Hello its Debra again with some wonderful news on a brand new model power suction LED lighted magnifying travel mirror. Following on from our very successful PSC210 Square power suction mirror Zadro have introduced this month a round battery powered LED Halo Lighted power suction magnifying mirror. If you have to attend late meetings or going to the gym and then on to work or perhaps you are going away for the weekend then this is the perfect magnifying mirror for you. Keep it in the car or in your travel bag but always have it with you. The LEDPSC110 lighted power suction 10x magnifying mirror features a large 16.5cm high quality optical mirror with 10X magnification, perfect for everyday cosmetic touch ups. With its custom positioning swivel head and powerful suction cup, getting a perfectly secure viewing angle is a breeze. Featuring a bright LED light, dim environments are no longer an issue. The eco-friendly LED bulbs never need replacing and consume 70% less energy than regular bulbs so that your 3 AAA batteries will last for 1 - 2 years. There is a convenient push button On/Off switch for you to choose if you want to use the light or not. Oh so wonderful to take away with you on holidays even to the gym if you need to go to an appointment straight after your workout. Bad lighting is no longer an issue. Just press it onto the mirror or any smooth surface and adjust to any of those versatile or viewable angles you need. With ease you can apply makeup, attend touch-ups or even pop in your contact lenses, quick check of your teeth, and the lippy and you’re ready to go. To remove the mirror from the wall just a small twist on the white bracket and the mirror is already to fold away for next time. Possible this is the best portable LED lighted mirror we have ever seen and coming from Zadro you know it’s a quality product. If you are worried about using a 10x mirror then don’t let it bother you. Once you have used a mirror with magnification like this you will easily be able to manage those details that bother you and get that perfection you desire and never go back. Finished a clean white acrylic on the backside and mirror mount this beautiful LED lighted magnifying mirror will also be an ideal gift for family and friends. This mirror is now in stock. I'm really excited with more new models and styles come to us very soon. I will update you the minute I have the details. Until next time remember to always have a smile on your face - you feel good and you will make others happy. Hi everyone it’s been a little too long since my last update, magnifying mirrors, led lighted mirrors and makeup and cosmetics mirrors we have seen so many new models and ideas since my last update. 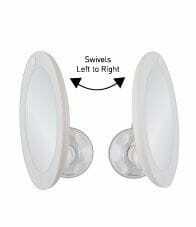 Our next shipment has two brand new to Australia LED wall mounted magnifying mirrors on board. When it gets a little closer I will give you a full update. For today I’ve chosen to tell you about a fogless mirror for the men in our lives. Use it in the shower in complete safety. The latest model and design for a fogless mirror has come from Zadro and uses an ingenious idea using water at the same temperature as the shower to stay fogless. This gives a perfect fogless mirror to use in the shower. Without a doubt this is a man’s mirror and perfect if you are one who likes to shave in the shower. It’s not easy to get a perfect shave but many don’t know that the only way to get that perfect shave is to shave in the shower! Dermatologists all over the world recommend shaving, cleansing, and exfoliating skin in the shower to receive the best results. The heat and humidity from a hot shower opens pores and soften hair follicles. This allows razors to more easily and closely shave away the hair, while avoiding painful tugging, pulling, and razor burn – well assuming you’re not using a blunt razor!. It’s common to not have a light in the ceiling above the shower so can make it a little dark to see. Zadro have built in 4 bright LED lights powered by 3 AA batteries that light up the entire mirror face, making shaving even easier, no matter your lighting situation. If you do not like to use a magnifying mirror then this is the perfect tough model to use. There are no worries about cutting yourself if the mirror gets knocked down and falls to the floor it has been made to be unbreakable. It will not rust unlike the chrome or gold versions that people put in the shower cubicle. A generous 15.5cm high by 13cm wide actual mirror surface gives plenty of size for you to see how well your shave is going, to attaché this unit to your shower Zadro have provided a handy mounting kit consisting of double sided tape and 3 suction cups and a small tube of silicone. Well I hope that good information for your man and I can’t wait to introduce you to our new models coming in June. Remember to smile and have a great week.